Universal's latest whole home collection introduction, Cordevalle, is a gorgeous representation of today's popular home decor style. Described as one part European traditional and one part Sonoma County Farmhouse, this collection seems to epitomize the current American casual style. As is with all Universal Furniture Collections, Cordevalle features amazing attention to detail and surprising enhancements throughout the collection. Start your tour in the bedroom with the Santa Rosa Poster Bed, because this bed simply is the focal point of this collection and brings a certain charm to your home. Featuring a subtle two-tone headboard, the wood grain detailing is a gorgeous nod to mother nature. This bed's four posts can be customized to suit your mood - place the tall posts, short posts, or no posts on the headboard and footboard to personlize it! 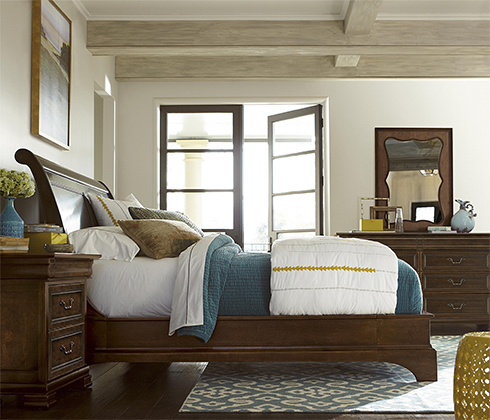 Don't worry - the Cordevalle Collection includes a Sleigh Bed option as well. With a soft, gentle curve and molding detailing throughout the bed's design you'll find that the Sonoma Sleigh Bed easily coordinates with the collection's case pieces just as well as the poster bed. Next to your bed, choose between the Cordevalle Collection's Nightstand or Bedside Table. With two distinctly different looks, maybe you'll decide to use both! The romantic bedside table features curved legs, a scalloped bottom edge, one bottom drawer, one pull out shelf, and two tiny doors to open for extra storage. The traditional nightstand provides three drawers for storage, including one hidden drawer, and a built-in power outlet station. 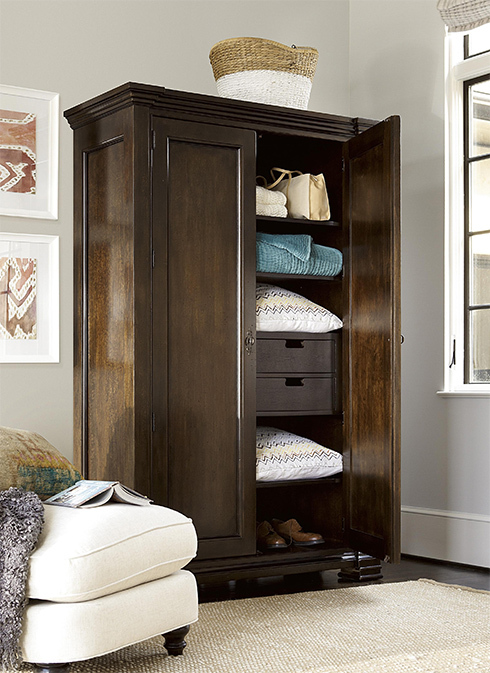 The standout piece from the Cordevalle's Bedroom Collection is the Vintner's Closet! With a timeless look and sophisticated design, this bedroom piece provides the extra storage you need. Inside, this piece offers three adjustable shelves, one fixed shelf, and four tray drawers. Time to dine! Cordevalle's Dining Room Collection is centered around the rectangular dining table. Starting at 84 inches long, utilize the table's leaves to extend the table to 108" long for family gatherings and holidays. Ladderback chairs line the sides of the table and provide a traditional look with a comfortable upholstered seat. The upholstered arm chairs make a statement with a wing chair silhouette and regal appearance. Cordevalle's dining credenza is beautiful from the outside but it's what's inside that truly counts! This dining piece offers storage and functionality that everyone needs. Behind the two panel doors you'll find three adjustable shelves, vertical dinnerware storage, and dry-fit wine storage. Two hidden storage drawers are felt lined for flatware storage, too. This piece is every entertainer and hostess's dream! If you're looking for a little extra dining room storage, try the Dining Room Cabinet. This piece helps showcase your favorite china or dinnerware up top with beautiful lighting and provides vertical platter and wine storage below. Another unique dining piece is the bakery rack - an industrial inspired piece to help provide extra storage whether it's functional, flattering or both! The five shelves give you plenty of space to stack some beautiful dishes and create a display that suits your kitchen or dining area. For your eat-in kitchen or smaller dining room, the round pedestal table from the Cordevalle Collection still encapsulates the fresh style! Joined by four of the ladderback side chairs, this dining set is simple and easy to imitate in your home. Don't forget your living room! The Cordevalle Collection offers an end table, a cocktail table, a sofa table and an entertainment console. These occasional pieces are a perfect fit for your casual living room. We love it paired here with a neutral sofa and fun bright rug. 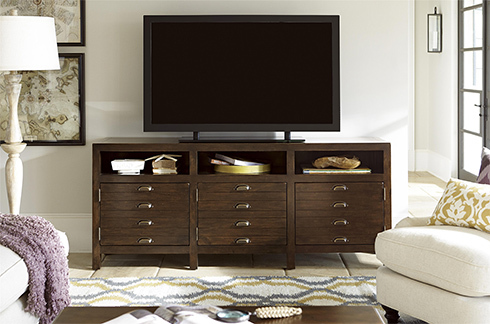 The Cordevalle Entertainment Console helps maximize your entertainment options with plenty of storage, wire management accessories, and a built-in power outlet. A perfect fit for many different sized tv's, this entertainment console is a chic look with the right amount of casual sophistication. To round out this whole home collection, we'll show you Cordevalle's ultra-functional pieces. This writing desk from the collection offers plenty of storage drawers to keep things organized, no excuses for a mess here! We saved the best for last! 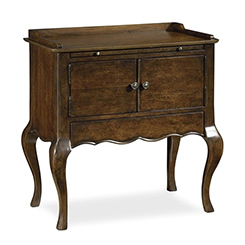 This Cordevalle piece, appropriately named the Innkeeper's Catch All Desk, is every mom's dream. Perfect for an entryway or kitchen, this desk helps keep the whole family organized with places for notepads, mail, vertical paper partitions, drawer storage, and a built-in outlet for a charging station. Find these Cordevalle pieces and many other whole home furniture collections in the Galleries Showroom - Building #1 in Belfort's Furniture Campus. Conveniently located in Dulles, Virginia, we're your one-stop-shop for everything home. Filled with hundreds of room settings, we're ready to inspire you and help guide your through your next project. We're all about creating beautiful rooms!